I’m going to show you how I light a daylight interior, at night, using fluorescents and LED’s you can buy from Amazon and your hardware store. And talk you a little bit about ambient light. This is my living room where I usually shoot my on-camera footage. I have windows facing south that let in a lot of daylight coming through white curtains and at times sunlight hits them. That's my key light. The light bouncing off the walls and ceiling, and the softbox next to the camera fill in my shadow side, my fill light. That bounce, along with my key and fill, is lighting the background, making up my ambient light. So this lighting-key, fill and ambient-is what we need to recreate. There’s no natural back light so no need to add any here. To recreate this daylight interior, I need to measure what the contrast ratio is between the key, fill and ambient light levels. This is important because those difference in levels are what give the audience the visual felling of a daytime interior. I’ll use my trusty Sekonic light meter. You can use any light meter, even one on your phone, or the built-in meter in your camera by zooming in on an area. Also recommend taking a still shot from your camera of the daytime lighting in the room you want to recreate, as a reference. Currently, I'm getting 80 foot candles (fc) total at my chair, that’s from the window, my key, the room fill, and fill light next to the camera. I’ll block the fill off the meter to get just my key light exposure, 80 fc, and then block out the key, to get my fill exposure. That’s around 60 fc, that’s a half stop difference between key to fill. Back here by the door, I'm getting 80 fc. That's a no stop difference between my overall exposure at the table of 80 fc, a 1 to 1 ratio. That’s what I’ll need to recreate tonight to make it look and feel like daytime. We’ll turn on the key. Here I’m using two 4ft, two bank fluorescents horizontally behind some diffusion. In this case, one of the same Ikea curtains I have on my windows. The light fixtures are the $15 hanging fluorescents I rigged to work off a light or grip stand in a previous video. The fluorescents give me a nice wide source and with the curtain recreate as best I can the soft daylight coming in the window. I’m getting close to 80 fc. For my fill, I’m using the same Neewer umbrella softbox I used during the day with a duel light socket. This way I can turn one or both bulbs on to adjust my fill light level. I have one big CFL bulb in there giving me a 60 fc fill and overall around 80 fc exposure. Note that I’m using soft lights everywhere. That daylight interior is all soft light: window daylight, bounce fill off of walls of the room etc. So no bare bulbs or point sources otherwise the effect will be ruined. Now for my ambient fill, I almost have enough light back there from the spill off this soft key light. But I need a little bit more and from the direction of the windows closer to the background. I’ve rigged the silk from my 5 in 1 reflector on a light stand. Behind it I have an LED par filling that frame and for additional light three LED bulbs with socket adapters in a power strip. Looks like a daylight interior right? Now, let's compare it to our video shot in the actual daytime. It’s pretty close, not exact. There are some high lights on that backdoor and shadows that I can’t recreate exactly but this looks good. Now I didn’t have to reach that same exposure light level of 80 fc, and you don’t have to either. You may have less or end up with more, that’s totally fine. It’s the ratio that’s important. My ambient in the background was the same reading as the subject. So if my subject was at 40 fc, I would make the background 40 fc. Since we’re lighting everything with our own lights, you can use whatever color temperature light you want, since you don’t have to match any actual daylight coming in the window. But, make sure all your lights are the same color temperature or your editor will kill you when it comes time to color correct. Mine here are all 5000k. Now we can pull off this bit of movie magic because we’re not showing the windows or the other room. If I had a crew and a grip/lighting truck, we would put lights right outside the window and probably an 8' by 8' or 12' by 12' frame with a bounce on it, muslin or grifflyon, and bounce some serious HMI lights into it to simulate soft daylight. 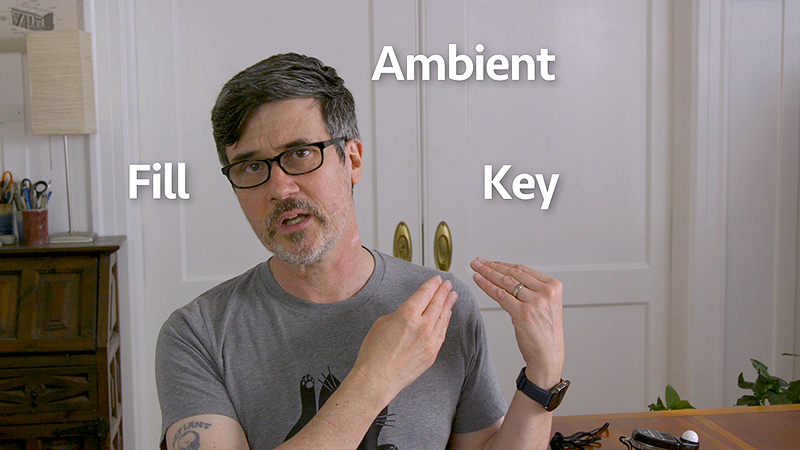 Just remember to use soft lights to simulate daylight, check and then match your contrast ratios to not only your key and fill, but also the every so important but oft-ignored, ambient light in your room.